Samsung C & T Corp. is scheduled put up its Seocho Woosung Number 1 Reconstructed Apt. Complex for installment sales in May, the company said recently. 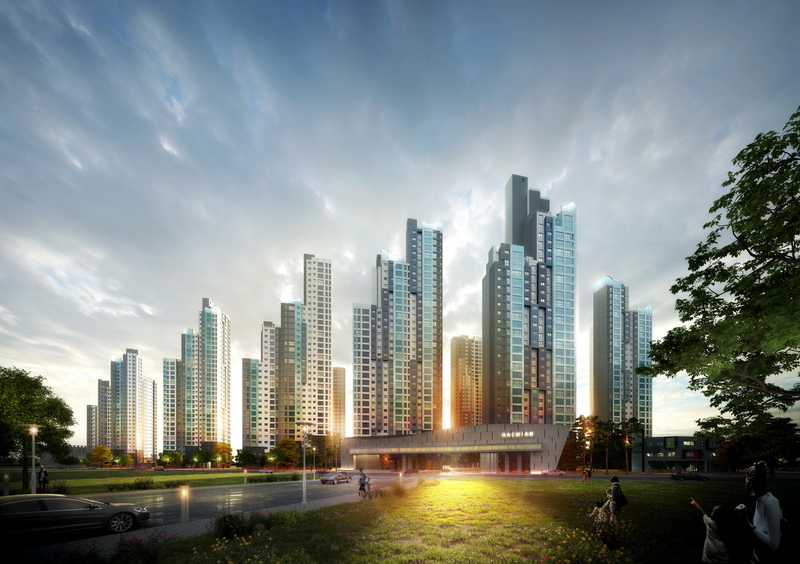 The complex consists of 1,317 apartment units with space ranging from 59 to 238 sq. meters. They’re in 12 buildings that are 35 storeys high plus three basement floors. 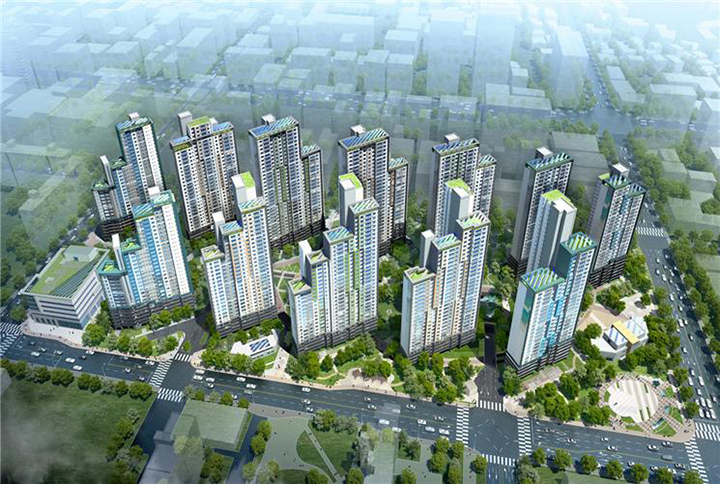 The apartments for general installment sales will total 232 units, with space ranging from 83 to 84 sq. meters, taking up around two thirds of the total units, the builder said, adding that some of the apartments include ones so big even among deluxe units in the Gangnam area of Seoul. The Seocho Woosung No. 1 Apt. Complex has everything nearby in terms of transportation, convenience facilities and education infrastructure. It is within walking distance of the Gangnam Subway Station, which is on Subway Line No. 2, and the neighboring areas will soon be reborn as a “brand residential town,” with so many apartment complexes in the area going through reconstruction, the company said. There is also Gangnam Boulevard and the Teheran Road, which are the two main thoroughfares in the southern area of the capital city, allowing for easy access to the Seoul-Busan Expressway. There also are many bus terminals nearby connecting the area to ever nook and cranny of the city, including buses running to the Inchoen Int’l Airport. Also nearby are art and entertainment facilities, including the Seoul Arts Center, the Gangnam Severance Hospital, the Mega Box Gangnam, the CGV Gangnam, and E-Mart, to name some. The area has some well known schools in Seoul, including Seoul High School, Seocho High School and Eungwang Girl’s High School, among others. Also within the vicinity are a group of well-known residential complexes, including the Raemian Seocho Estige, with 421 apt units. The Seocho Woosung No. 3 Reconstruction with the residents moving in in Dec. 2016. The Raemian Secho Estige S with 593 apt units, the Seocho Woosung No. 2 Reconstruction with the residents scheduled to move in January. The builder said all the apartments in the complex will be equipped with “sensing air exchangers” to keep the air free from fine dust and other pollutants. There will be “air shower rooms” to clean people as they enter their homes. Samsung C&T is at the forefront of the construction industry to develop equipment mixed with new technologies including a home cube system with IoT, which is to be installed in the new apartment complexes being built by the builder around the country. Samsung C&T Corporation was founded in 1938 as a parent company of Samsung Group to engage in overseas sales operations. Since 1995, it has been largely focused on global engineering and construction projects, trade and investment, fashion and resorts. The corporation is governed by an 11-member Board of Directors, made up of the President and CEOs of its four working groups, the corporation’s CFO, and six independent members. Samsung C&T employs just under 13,000. In 1975, Samsung C&T was designated by the Korean government as the first general trading company to lead overseas sales operations. After the company merged with Samsung Construction in December 1995, Samsung C&T began engaging in global business with offices in more than 50 countries. In September 2015, Samsung C&T merged with Cheil Industries, a Korean textile firm prominent in the fashion industry that was originally acquired by Samsung Everland in December 2013. The resulting Samsung C&T focuses on fashion, food, housing, leisure, and bio businesses with its Engineering & Construction, Trading & Investment, Fashion and Resort & Construction Groups. The merger has established a third pillar for the Samsung Group, adding to its electronics and financial services.